If a cell in Guantanamo Bay, the American prison holding two Australians captured in the war on terrorism [The Coalition of the Killing's resource wars in the Middle East], had a broken toilet, was full of vermin, rats and cockroaches, and bread was the only food, would a detainee not be justified in law to try to escape? This was the question Justice Michael Kirby threw at the Federal Government's barrister, the Solicitor-General David Bennett QC, in a ground-breaking case heard in the High Court yesterday, testing for the first time Australia's mandatory immigration detention scheme. The hearing involved three separate cases. In one, asylum seekers who escaped from the Woomera detention centre claimed as their defence that conditions were so bad their detention was invalid. The Solicitor-General argued that if conditions were bad in prison, a person had the right to seek remedies in either tort or criminal law; but no matter how bad the conditions, it did not make the detention itself illegal. His argument divided the bench. Justice Kirby said he had seen prisons in Cambodia which were so bad that if he were detained in one he would "feel duty-bound, as a human being, to remove myself from it". "If you say that if conditions fall below those standards, which are standards of human dignity, are so awful that they do not then respond to the word in an Australian statute - 'prison', 'detention', 'punishment' - then a person is not in prison, detention or punishment but in a vermin-infested cell and therefore entitled to walk away from it, because that is not the lawful punishment for which Australian law provides," Justice Kirby said. However, some of his brother judges took a different view. Justice Kirby cautioned him to "keep an open mind" and said: "A point would be reached where, if there is violence, that is not punishment, that is not the lawful punishment that a court of law in Australia has provided." The second case testing the legitimacy of immigration detention concerns Iraqi-born Abbas Al-Khafaji, whom the Government acknowledges is a refugee but denies him a visa, saying he could seek asylum in Syria. The man was released from detention by the Federal Court after three years because, although he had been asked to be deported, the Government had been unable to find a country willing to accept him. The third case involves a stateless Palestinian whose refugee application has been refused. He too has asked to be deported, without success. Justice Ian Callinan also clashed with Justice Kirby over his comments about Australia's obligations to asylum seekers found not to be refugees. Justice Callinan suggested that in relation to people found not to be refugees, "then possibly none of the [Refugee] Convention provisions at all apply to them". Justice Kirby retorted: "Surely you cannot just lock them [up] forever because they do not happen to meet the requirements of the convention." "I am not suggesting that," Justice Callinan replied. "It may be that if they do not have any status as refugees, then they may be dealt with in a different way entirely from the way in which the convention requires them to be dealt with." 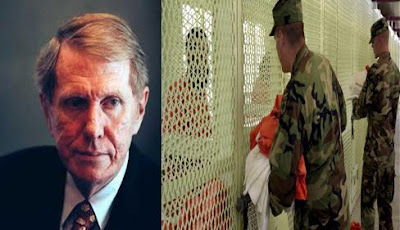 Former federal judges, diplomats, military officials and human rights advocates in the United States have urged the Supreme Court to review the cases of detainees [scapegoats for the Coalition of the Killing's resource wars in the Middle East], being held without charge at Guantanamo Bay in the name of terrorism. A Family Court judge, for a second time, has appealed to Immigration Minister, war criminal, Philip Ruddock to address the issue of children in detention. If anyone has known a schizophrenic then you may also know that it is because of some sound or picture that invaded their thoughts which sent them mad. So possibly, any invasion of my time with self, a time to integrate past experiences could send someone mad. However if there is no interference with our own thoughts and ideas we sometimes choose to write down our conclusions and share our ideas with others socially. Ruddock said it is unfortunate the Full Court of the Family Court made the decision. He said a successful High Court challenge could see the children returned to detention. Opponents vow to fight yesterday's Family Court ruling against the release of five children from South Australia's Baxter detention centre has strengthened the resolve of groups fighting the Federal Government's policy of detaining child asylum seekers. Where did you say you reside Mr Carr? New South Wales Premier Bob Carr says a protest outside Immigration Minister Philip Ruddock's Sydney home should have been called off for moral reasons. Mr Carr says people who want to protest against the Federal Government's immigration policies should do it in Sydney's CBD, not outside Mr Ruddock's home. Protest organisers have been critical of police actions at a pro-refugee rally near Immigration Minister Philip Ruddock's Sydney home. Democrat's leader Andrew Bartlett wants all children in immigration detention centres released, in the wake of the Family Court refusal to put a stay on one of its landmark rulings. Human rights group Amnesty International is pressuring the Federal Government to immediately release children from detention centres in the wake of the latest report on detainee children. A report being released today documents disturbing evidence about mental health for children in detention centres. The report is a joint work by the Royal Australian and New Zealand College of Psychiatrists, NSW University and NSW psychiatrists. Thousands of demonstrators will converged at Port Augusta in preparation for this weekend's expected protest at the Baxter detention centre.